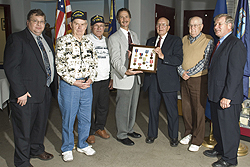 WWII Veterans with event officials (l to r): Robert Fuhrman, Melvin Hall, Leo Franklin, Floyd Miras, Richard Bibby, Ken Johansen, and Richard Stewart. Credit line: Photo by UMD Photographer Brett Groehler. In conjunction with the September Annual Meetings, GLMRI co-sponsored, along with the Richard I. Bong WWII Heritage Center, a reception and program to honor Merchant Marine Veterans in the Duluth-Superior area. Dr. Richard Stewart, former Captain in the Naval Reserves and a graduate of the US Merchant Marine Academy at Kings Point, NY, was Master of Ceremonies for the event. Mr. Floyd Miras, from the U.S. Maritime Administration Great Lakes Gateway Office, presented a slate of medals to WWII Veteran Mr. Richard Bibby of Duluth. Mr. Robert Fuhrman, Director of the Bong Heritage Center, provided an overview of the museum and the collection initiative. Also in attendance were WWII Veterans Leo Franklin, Duluth; Melvin Hall, Cloquet, Minn.; and Ken Johansen, Gordon, Wisc.